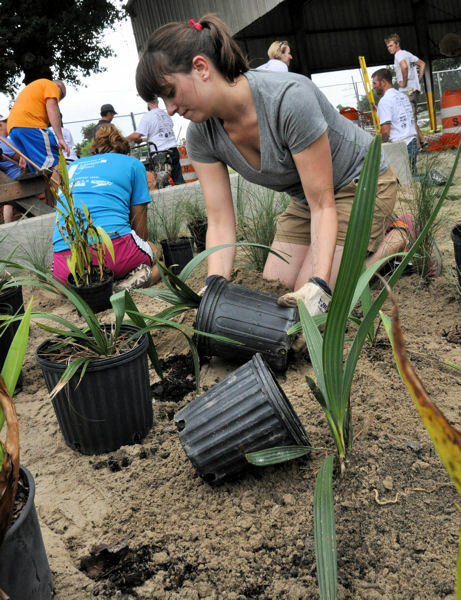 During WEFTEC 2014, 110 volunteers helped construct a rain garden and bioswales at Conrad Park in New Orleans. Photo courtesy of the Sewerage and Water Board of New Orleans. On Sept. 27, volunteers from across the country congregated in New Orleans to participate in the 7th annual Water Environment Federation (WEF; Alexandria, Va.) Community Service Project, “Recharge, Restore, Revitalize Hollygrove: Conrad Park Green Infrastructure Enhancements.” As WEFTEC® 2014 was just beginning, 110 volunteers spent their Saturday constructing a rain garden and bioswales at Conrad Park, a recreation hub in the Hollygrove neighborhood. The park suffers from flooding during wet weather events. The flooding prevents neighborhood children from using the playground, basketball court, and community center. With an average rainfall of 163 cm (64 in.) per year, New Orleans ranks as the third highest location for rainfall in the country, according to a survey by WeatherBill, currently known as The Climate Corp. (San Francisco). Because Hollygrove is a naturally low-lying neighborhood, it is even more susceptible to flooding and since Conrad Park is an integral part of the community, the WEF Students and Young Professionals Committee (SYPC) organized WEFTEC volunteers to provide a solution for the park’s flooding issues. Volunteers spread aggregate, loam soil, and more than 800 plants throughout the park for the annual WEF Community Service Project. Photo courtesy of the Sewerage and Water Board of New Orleans. Installing the project’s rain garden and three bioswales will reduce the volume of stormwater in the park both during and after a rainfall. The green infrastructure also should reduce the velocity of the stormwater before it reaches nearby gray infrastructure. 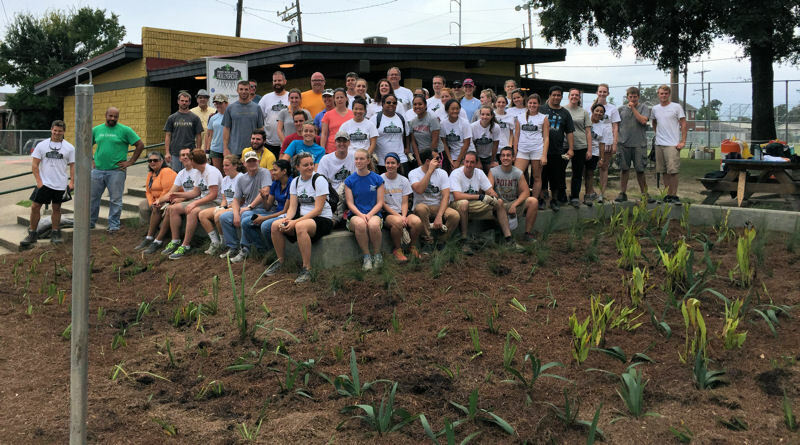 For the service project, the green infrastructure areas were excavated and a retaining wall was built before volunteers arrived onsite. The volunteers started the day building bioswales by placing aggregate into trenches located between the park and neighboring roads. Volunteers also helped construct the rain garden by filling a large area inside the park with aggregate. WEF past presidents Jim Clark and Rebecca West also lent a hand. Volunteers spread sandy loam soil on top of the aggregate in all four areas. In the rain garden, they planted more than 800 plants. The permeable layers of the green infrastructure will allow stormwater to infiltrate the ground easily, instead of pooling on top of the compacted soil that was removed from the park as part of this project. Through transpiration, the plants will reduce the volume of stormwater. In addition to the green infrastructure elements, volunteers helped create a path to enable easier access among the recreation areas. Volunteers also picked up trash in the park and surrounding neighborhood. In total, the project volunteers helped install 242 m2 (2600 ft2) of green infrastructure. Activity stations engaged the local community in stormwater-related educational activities such as painting rain barrels. Photo courtesy of the Sewerage and Water Board of New Orleans. The project also included several outreach activities to engage and inform the local community. One activity station featured rain barrels in need of some color. 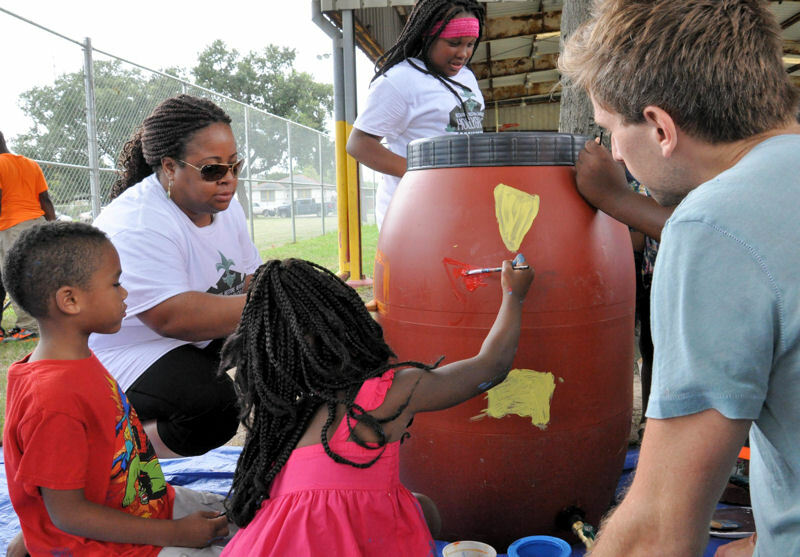 Neighborhood children were encouraged to paint designs on these rain barrels. Tanks of mosquito larvae, turtles, and fish were set up at another station to emphasize the importance of eliminating standing water where mosquitoes could lay their eggs. At a third station, children were able to spray a landscape model with water, to see the effects of stormwater and nonpoint source pollution. 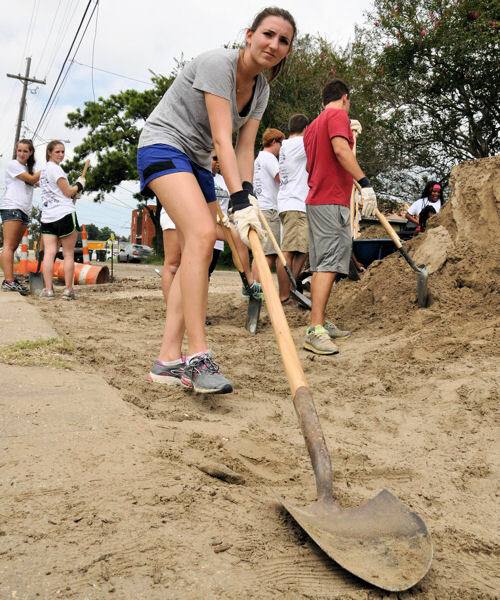 Project volunteers helped construct a rain garden, three bioswales, and a pathway during the WEFTEC 2014 service project, organized by the SYPC. Photo courtesy of the Sewerage and Water Board of New Orleans. As the day drew to a close, a collection of WEF and water sector leader thanked the volunteers. WEF 2013–2014 President Sandra Ralston, the Sewerage and Water Board of New Orleans Executive Director Cedric Grant, New Orleans City Councilmember Susan Guidry, and SYPC service project co-chair Michael Quamme emphasized the importance of the project, not only to the surrounding neighborhood, but also to the city as a whole. This year’s project was led by the SYPC chair Haley Falconer, vice chair Michelle Hatcher, and service project co-chairs Quamme and Timothy Moran. Other SYPC volunteers who helped plan the event included Kristin Waller, Kyle Logue, Jennifer Loudon, Lisa Oberreiter, and Anthony Giovannone. Volunteers for the WEFTEC® 2014 service project “Recharge, Restore, Revitalize Hollygrove: Conrad Park Green Infrastructure Enhancements,” helped build a rain garden and bioswales. Conrad Park experienced flooding during storms. See the park during storms before this project in the Highlights article, “Dig-In To Leave a Stormwater Solution in New Orleans During WEFTEC® 2014.” Photos courtesy of Michael Quamme, Timothy Moran, and the Sewerage and Water Board of New Orleans.